Respiratory failure if the lung muscles are weakened. From 2012 to 2015, it was noted there were increasing reports of a distinct syndrome consisting of acute flaccid paralysis with anterior myelitis within the United States. 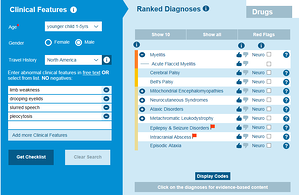 Terms used previously were ‘poliomyelitis’ or ‘polio-like syndrome’ for these features. To distinguish from these terms the presentation of this distinct syndrome was classified as ‘acute flaccid paralysis with anterior myelitis’ or ‘acute flaccid myelitis (AFM)’ as its now recognized. AFM is a rare but serious condition. It is not a new condition but due to the increase of AFM cases, surveillance of the condition by the CDC (Centers for Disease Control and Prevention) was started in 2014. 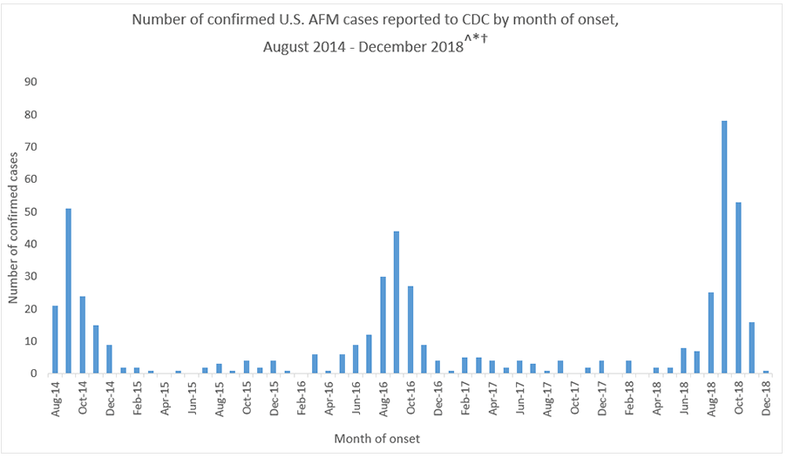 The CDC have found increases in AFM every 2 years since 2014 and mostly in young children although adults can be affected as well. The CDC estimates that less than 1-2 million children in the United States will get AFM every year. AFM has been identified in 46 states of the U.S. and DC. The cause of AFM is still under review. Viruses are likely to play a role. More than 90% of the patients with confirmed AFM studied by the CDC had a mild respiratory illness or fever consistent with a viral infection before they developed AFM. What has been found is that all stool specimens studied of patients with confirmed AFM have been negative for poliovirus. As can be seen from the table above there has been a spike of confirmed AFM cases between August and October. This is when many viruses commonly circulate, including enteroviruses. Viruses detected in samples obtained from patients with confirmed AFM have included coxsackievirus A16, EV-A71 and EV-D68 but only amount to 4 confirmed causes out of the 522 patients. So far no other pathogens have been found in spinal cord samples. The reason for this is still being studied but it may be that the pathogen clears the body quickly or is hiding in tissues which make it difficult to identify. It could also be that the pathogen triggers an immune response in the body that causes damage to the spinal cord. Reviewing the patient’s symptoms and examining their nervous system will shows areas of weakness, poor muscle tone, and decreased reflexes. An MRI will also be performed to look in depth at the patient’s brain and spinal cord and hopefully identify a spinal cord lesion largely restricted to the gray matter and spanning one or more vertebral segments. It should be noted that spinal cord lesions may not be present on the initial MRI so a normal MRI performed within 72 hours onset of limb weakness does not rule out AFM. Lab tests will be performed on the cerebrospinal fluid to look for pleocytosis, as will nerve conduction studies. Early recognition of AFM symptoms, and subsequently carrying out the tests outlined above, is important to make a prompt diagnosis. AFM is difficult to diagnose as the symptoms are similar to other neurologic diseases including transverse myelitis, Guillain-Barre syndrome and acute disseminated encephalomyelitis. With the help of testing, in-depth examinations, and clinical decision support tools such as the Isabel DDx Generator, it is possible to distinguish between AFM and other neurologic conditions. Treatment is supportive and is provided by a neurology team who specialize in treating brain and spinal cord illnesses. Treatment is aimed at providing support and relief for the patient’s symptoms, which vary on a case by case basis. They may need physical therapy if weakness is a problem, or mechanical ventilation if the lungs cause respiratory compromise. The CDC has provided interim considerations for the clinical management of patients with AFM. AFM is a rare and intriguing disease. Recognizing symptoms and forming an early differential diagnosis from clinical history and tests will help with an accurate diagnosis. Long term effects on patients who have AFM are still being correlated as data collection is still in its infancy, due to surveillance of the disease and its reclassification starting in 2014 when case incidence was noted. Reporting of cases to the CDC is important, along with providing specimens from patients, so that ongoing research and analysis can lead to more information on the causes and management of AFM.